How do you grow land, you may be asking? […] The first step, apparently, is to take out-of-commission subway cars, drop them into the river and cover them with landfill. A medium-sized shopping mall contains about 400 to 500 thousand square feet. If this sounds crazy, you should know that New York regularly dumps outdated subway cars into the Atlantic Ocean, simply because they have nowhere else to dispose of them. 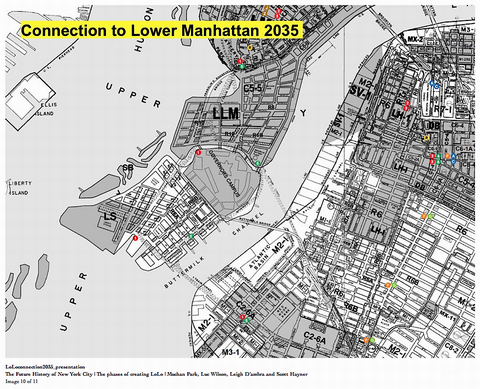 But instead of trashing the cars, we might very well be able to use them to our benefit, recycling them into the slow expansion of an 88-100 million square foot land mass, a borough they're tentatively calling Lo-Lo Ma. Source: Urban Omnibus, from Mammoth. Another example. The “tourist landscape of the beach” in Delaware (and at other spots along the East Coast) is now an artifact sustained, if not created, by dredging. This means displacing those thousands of cubic yards of sand from the ocean floor and using massive compressing stations to pump tiny rocks through miles of hulking metal tubes. […] The miles of pressurized metal tubing will certainly be removed before the summer’s vacationers have a chance to take them in. Pumping and compressing stations are only small hiccups in the gaping expanse of the ocean horizon, often unnoticed by winter ocean-goers. The dredge infrastructure’s impermanence in the oceanfront landscape is central to its work of producing the “natural” beach, an object of consumption for the seasonal tourism within the region. 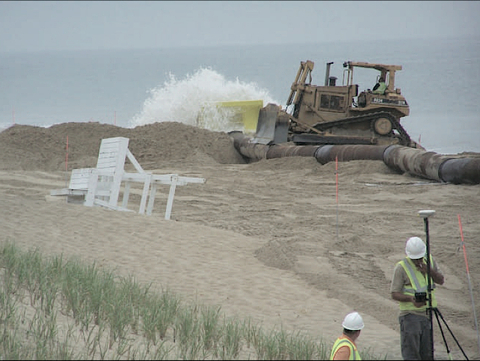 This particular operation, according to the Delaware Department of Natural Resources and Environmental Control’s (DNREC) newsletter, is repairing the beach damage incurred from a 2008 Mother’s Day storm that pockmarked the beach with massive craters and distorted the function and image of the beach as a tourist destination. The storm, a geographic and meteorological event that, in part, could be due to anthropogenic changes in global weather patterns, damaged the beach to the point of putting nearby housing in jeopardy of being engulfed by the high tide. In response, the dredging operation is rebuilding the beach as a protective boundary to the adjacent tourist housing (Chris Mizes, “.dredge”, space within lines 5 Feb 2012). 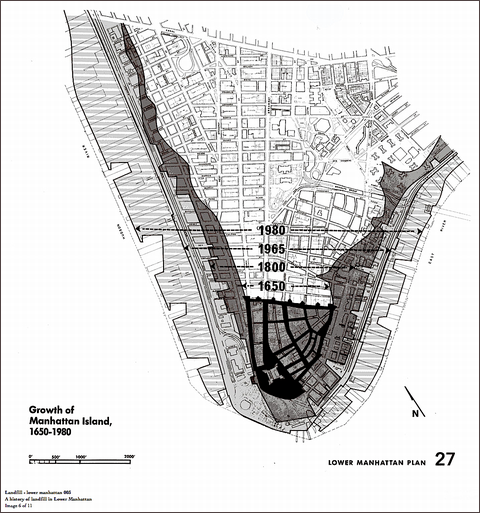 Source: DNREC Division of Soil and Water Conservation, Shoreline and Waterway Management Section, Coastal Connection 3no3 (Summer 2009). Unlike architects, philosophers, so far as I can tell, have had very little to say about the immensity of human intervention in natural processes except by implication, when they write in a general way about the relation of humanity to the natural world (needless to say, I welcome references). The scale of projects like Lo-Lo Ma or the Delaware beaches seems to defeat traditional æsthetics, oriented as it is toward artworks on a more modest scale. The industrial landscapes photographed by Edward Burtynsky and others challenge the imagination in the manner that Kant takes to be characteristic of the sublime. But rather than offering us, as the starry heavens above do, a natural counterpoint to the moral law within, these landscapes present us within infernal ideas of its absence. 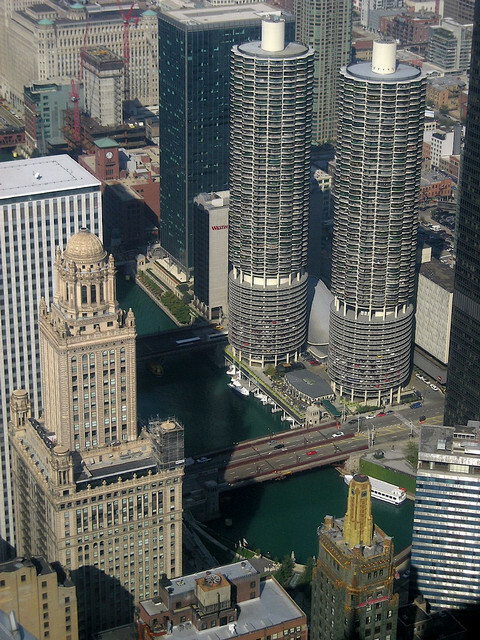 What may have been my first experience of the nonnatural sublime occurred thirty years or so before the picture below was taken, when I was walking near the Marina Towers in Chicago and realized I had no idea where the ground was. Marina Towers, Chicago (2007). Source: Araceli Arroyo at Flickr.